Carnatica is deeply honoured to be collaborating with legendary Mridangam vidwan, Sangita Kalanidhi Umayalpuram Sri. K. Sivaraman on various projects aimed at propagation of Carnatic Music. Sri. Sivaraman has evinced interest in documenting the features of his distinctive style of percussion, accompanying young and upcoming artistes to encourage them on the lines of great masters of the past and in leading regular 'Layanubhava' sessions on the lines of our popular raga appreciation series ('Raganubhava'). Carnatica is also releasing a few new music albums on CD & DVD this week. The DVDs include a group rendition of the Ghana Raga Pancharatnas, featuring a group of young and upcoming musicians. Another one is a live recording of a lecture-concert by musicologist Prof. S. R. Janakiraman on “Ekaika Kriti Ragas”. Smt. Sowmya’s popular live video recording of Bharatiyar compositions is also being released in DVD format. 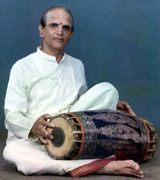 Other releases include ‘Sangeetarpanam’ by Carnatica Brothers (Shashikiran & Ganesh), Shyama Shastri compositions by veteran musician A. Sundaresan (disciple of Ramnad Krishnan and guru of popular vocalist Gayathri Venkataraghavan) and 'Hamsanadam' (featuring Sikkil Gurucharan, Nisha Rajagopal & Trichy Pradeepkumar), a collection of compositions by Dr. Natarajan Subramanian. Another new release is a keyboard recital by talented 9-year old Baby Sushmita, a student of the Carnatica Gurukulam. She has dedicated her effort in aid of Sankara Nethralaya, Chennai.